On many of his programs Maurice gives a gift to each person in the audience, a gift that carries the essence of his message. Over the year's these have shown up tacked to bulletin boards and stuck on filing cabinets and fridges all over North America. Maurice is happy to make the six most popular handouts available to all. They have his current address and phone number, in case yours has been around a while. 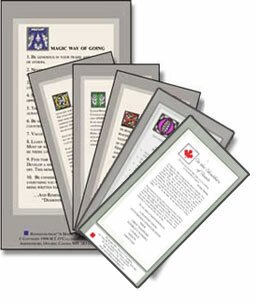 They are available as Adobe PDF files and can be printed on any printer. If you do not have Adobe Acrobat. Visit www.adobe.com and download it for free. Click on the titles you wish to view and then you can send them directly to print.